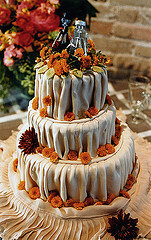 A Halloween wedding cake is a fun option for a fall or Halloween-themed wedding. 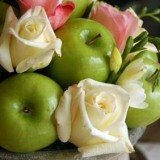 If you are looking for something different, you are on the right track. 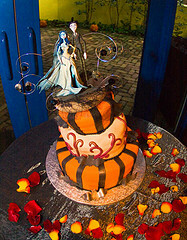 Halloween is a great time to get married, and your cake can help to pull your entire theme together. You will want your Halloween cake to fit in with the rest of your theme, however. 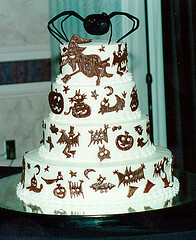 For example, you wouldn't want have a vineyard wedding with a Halloween cake. It just wouldn't look right. Your first step is to find an experienced cake designer that is familiar with making this type of cake. 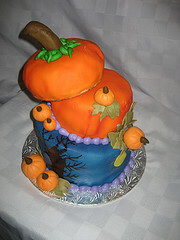 You may have to ask around and make some calls to find a cake designer in your area that can create your Halloween cake. The second step is to decide on what you want your cake to look like. You will most likely want your cake to be fun while still being classy and elegant, and a good cake designer can help you pull that off. 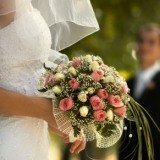 Third, you will need to decide whether to use a Halloween cake topper or not. Some cakes look great without a topper, and other cakes need that finishing touch.